Sierra Leone. Liberia. Guinea. Driving from one capital to another, from one end of the border to the other, I cannot help but notice that the last 27 years have been particularly difficult for life in these three greatly endowed countries. They form what is known as the Mano River Union (MRU). In 1989, the First Liberian Civil broke out, hundreds of thousands of lives were lost. Not long after this war started, in 1991 the Sierra Leone Civil war broke out. 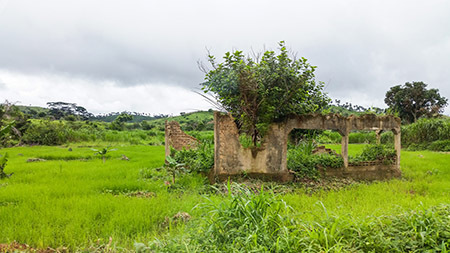 In 1997, it was thought that life had come back to normal in Liberia, but just two years later, backed by neighboring Guinea, the Second Liberia Civil war broke out. The impact and effects of each of these wars spilled so easily over to each one of its neighboring Mano River Union comrades. War drums have since 2003 been terminated, with a sincere living hope, that they will never sound again, ever. Moving through the border regions of the great countries, I easily notice the pain and impact the times of war have caused to the lives in these three countries. You so easily see houses, very well constructed, abandoned in the bushes no longer habited. Where are the inhabitants… do not ask that question. Abandoned house. CC-BY David Luswata. Greatly endowed with the Atlantic Ocean, very many rivers, thick forests and great diamond and other mineral deposits, “Life has since then been on an upward scale. Every one going about their business, building a nation and a region again,” narrates my driver as we cruise through the potholed roads of Macenta Prefecture in Guinea on our way to Liberia. “It was so until something strange came among us. We had fought many battles, but this was to be different. We were fighting an enemy we could not see. We didn’t know where he came from, we had never heard or seen something like that.” he continues. Navigation using [OsmAnd](http://osmand.net/). CC-BY David Luswata. It is called the Ebola Virus Disease (EVD). It’s one of the strangest disease outbreaks of recent history. As it were, a single case can turn into a full brown outbreak with in just days, if unknown or left unchecked. In 2014, in a small village in Guinea, it was thought to be a normal death, within weeks, it spread like a spirited fire. Spread across to Liberia and Sierra Leone and many other places. Life was extremely unbearable. As weeks went by, there was an increasing somber feeling sweeping across the region, people were dying. This outbreak was another great threat to the region. In January, March and June 2016, WHO declared the end of the EVD outbreak in Liberia, Sierra Leone and Guinea respectively. However, individuals departing and entering any of these countries are required to take temperature readings. This is still happening as well at all border crossings in the region. Getting a temperature reading at a border crossing. CC-BY David Luswata. 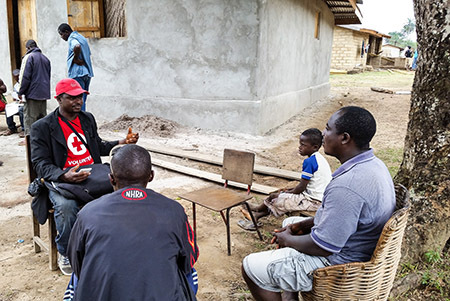 Our work in the recent couple of months has been to map communities in a 15Km buffer of the three countries’ borders – this was the region most affected by EVD. This has been achieved over and above our expectation. Each of these countries has had its challenges in mapping the communities, but the successes supersede the somewhat expected challenges. The border area forms an interior part of the three countries, with thick forests in most parts, many rivers and several types of wild animals. Roads are in indeed poorer conditions in these border areas, telecommunication signals unavailable in a vast part of the region and socio-economic facilities and services far-fetched in majority of the places. The power of volunteerism still reaches even to the very remotes village. Equipped with a mobile phone, OMK, ODK, OsmAnd and OpenSignal, we sent volunteers to as many communities as people live in. Some places, a motorbike can’t reach, you have to walk for some hours to get to a community, or in some, grab a boat. 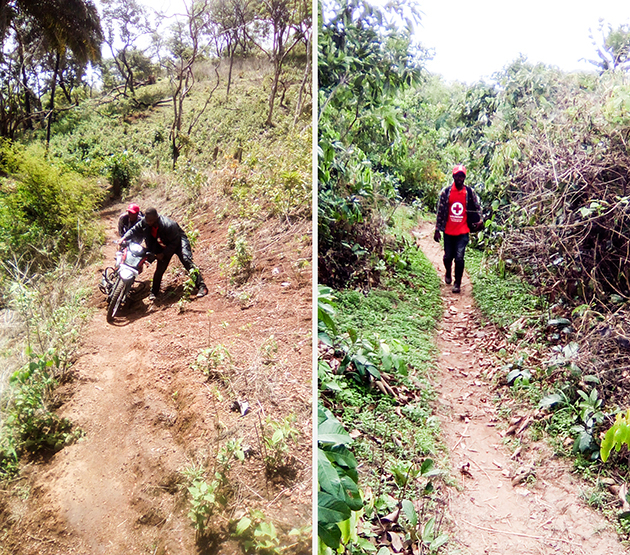 Travel by motorbike and foot may be the only way to reach some communities. CC-BY David Luswata. With some volunteers not owning a smart phone, tests were done and the best volunteers were selected. 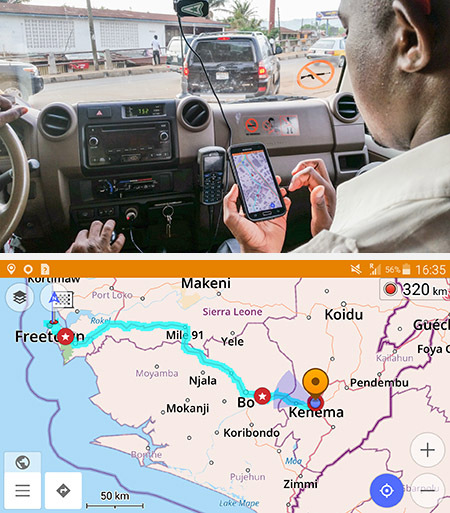 With the excitement of the new tools to use, volunteers spread out to the entire region, first in Liberia, then Guinea and then Sierra Leone. Having lost several relatives and community members in the epidemic, the stories of these energetic and passionate volunteers drive me to map one more village, and want to teach whoever I can reach how to map. 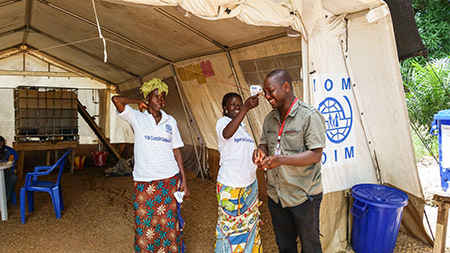 Many of them participated in contact tracing and community sensitization during the pandemic. Building on these basic tech skills, we are building a community that will continue to map these countries, putting the world’s most vulnerable people on the map. A volunteer gathering data from community members. CC-BY David Luswata. One of the most rewarding moments is when volunteers ask to have these tools on their personal phones. They continue to frequent the Hub eager to take part in all that may be available. We are looking forward to having many hang around the Hub, analyzing and cleaning the data they having been collecting, and learning how to submit it and how to make edits to OpenStreetMap. The mapping of many of these communities, and other parts of the region in West Africa is making valuable data available to governments, different development partners and the local population, thus guiding and informing the trends of transformation in the region.